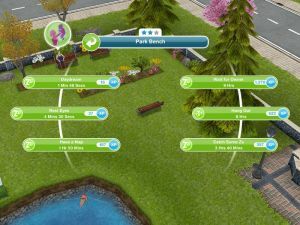 Here is another fun Quest which is unlocked when you see the Pet in a box in the Park. 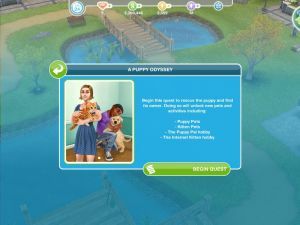 The story behind it is that a puppy is lost in the Park, you need to help rescue it and find it's owner and you will then unlock Puppy and Kitten Pets as well as new Activities for them. 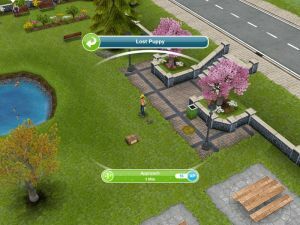 He's in the Park, whistle a Sim to the Park and tap the puppy. 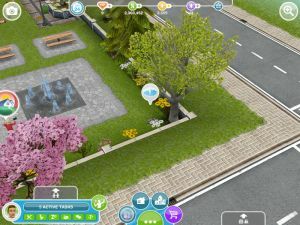 There is a puppy in the bottom left corner of the Park with a speech bubble, tap that. Tap the puppy with the speech bubble in the Park. 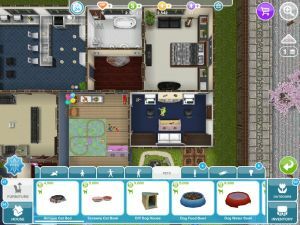 You can get a Dog Food Boel from the Home Store in the Pets category. Head over to the Fridge in the house and tap it for this option. 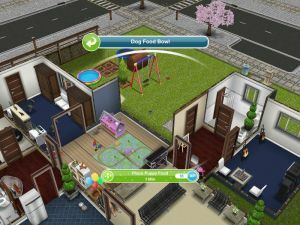 Tap the Dog Bowl that you just bought from the Home Store and you'll get this option. Head to a bookshelf or bookcase (Adult one) and choose the puppy book. 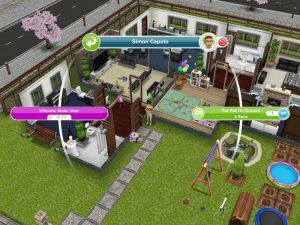 Put the puppy on the ground by tapping the Sim holding it (assuming he still is) you should see Osiris the Alien walking around the house, if you can't just go to a house or failing that, turn your game off then on again. Tap the alien and there should be a Greet option, use that. Tap the puppy on the ground to do this. There should be a blue speech bubble cloud to allow you to do this. 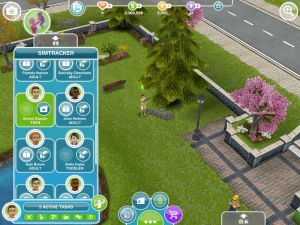 A kitten has appeared in your house or garden, tap him and click the Pet option. 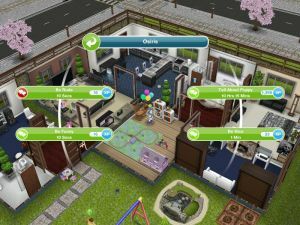 Osiris the Alien should be at your house. Tap him and tell him about the Puppy. 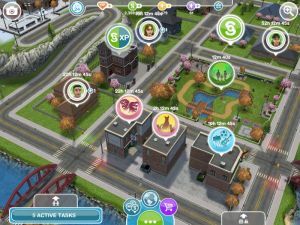 Go to The Town Map and Click on the Pet Store. You just need to tap it, then use the green exit arrow. 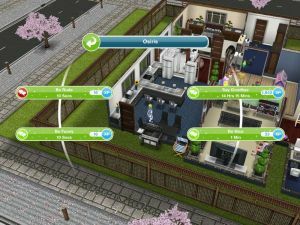 From the Sims character menu, tap the Osiris icon and you'll go to wherever Osiris is, if another Sim is not there too, whistle for one and then tap say goodbye. And that concludes A Puppy Odyssey, The Puppy Pal and Internet Kitten hobbies are now unlocked. 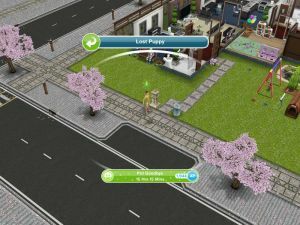 If you completed this Quest within the time limit that you would have also unlocked new outfits for your Pets - You can get them at the Pet Salon in the SImTown map. 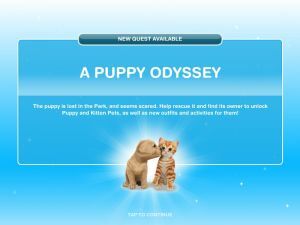 The completion of this quest may also start a Puppy Pals Hobby Event, which is a seven day limited time event, we have written up about it here. 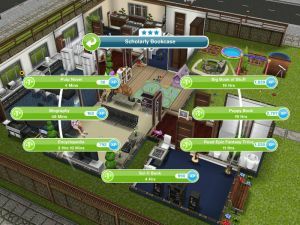 If you can complete it within the time limit you can win pet themed clothing for your Sims and maybe even a Poodle!